L to R: Nancy Gallardo, Sarah Jo Shomin, and Cody Bigjohn Jr. The three of them will walk from Mackinaw City to Lansing, praying for the water as they go. Indigenous water walkers will travel from Mackinaw City to Lansing to call for a shutdown of Enbridge’s Line 5 oil pipelines. Sarah Jo Shomin, Nancy Gallardo, and Cody Bigjohn Jr. plan to walk 311 miles over the next 17 days. They're calling the journey "N'biish Nibimosaadaanaa", which is Anishinaabemowin for "We Walk for Water." They say they plan to stay in prayer the entire time. Shomin is the leader of the walk. She wants to send a specific message to state politicians. "I’m hoping they realize that we love our water, how much we love our water," she says. "We’re willing to walk 300 miles to you to remind you of the promises you made of shutting down Line 5." 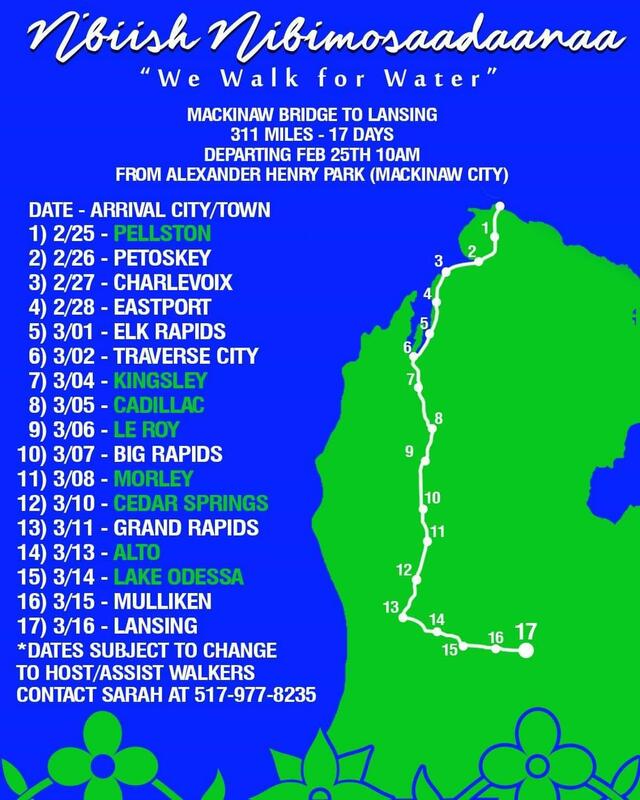 Water walkers will travel more than 300 miles from Mackinaw City to Lansing. Walkers will rely on volunteers along the way to provide food and lodging. Their route will take them through Petoskey, Traverse City, and Grand Rapids before turning east to Lansing. Their walk begins just days after the passing of Josephine Mandamin, a prominent Anishinaabe elder from the Wiikwemkoong First Nation who walked tens of thousands of miles around the Great Lakes. Shomin is nervous about the weather conditions. They hope to finish their walk on March 16th at the State Capitol. The Line 5 pipelines carry oil and natural gas beneath the Straits of Mackinac. Indigenous activists and environmentalists have called for a shutdown for years, citing fears of a spill and the link between fossil fuels and climate change. Former Governor Rick Snyder signed a lame-duck law allowing Enbridge to replace Line 5 with a tunnel and keep the existing pipelines in operation until its completion. Both Governor Gretchen Whitmer and Attorney General Dana Nessel promised to shut down Line 5 during their campaigns. Whitmer has asked Nessel to review the constitutionality of the Line 5 legislation. "The tunnel replacement project is an investment in Michigan and it will make a safe pipeline safer. Multiple layers of protection from placing the pipeline in a tunnel with one-foot-thick concrete walls make the chances of a leak into the Straits virtually zero. - Enhancing safety at other Line 5 water crossings."